Fly-posting is displaying adverts and other promotional materials without permission, on buildings, posts, poles, litter bins and elsewhere in public. Fly-posting is mainly done by businesses and community groups that want free advertising. 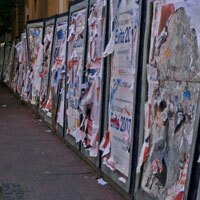 Many local councils have a 'zero tolerance' policy on fly-posting. Scotland has similar provisions under the Roads (Scotland) Act 1984 and the Town and Country Planning (Scotland) Act 1997. The only sanction is prosecution before a sheriff, who can impose a fine of up to £1000 and, if the offence is under the 1997 Act and continues after conviction, an additional fine of up to £100 per day. Visit the Law Search page for full details. Powered by Smart Media. Copyright © 2008-2017 UK Environmental Law Association. Copyright © 2008-2011 UK Environmental Law Association.